Although it might seem like common sense, there are many ways to ask for a job and many ways to be effective doing so. Creativity is often an asset as well as persistence, though each should be used with caution. Conversely, when asking for a job, there are many ways not to be effective. Furthermore, there are many different situations when asking for a job is appropriate and other situations where it is not. Understanding these different situations is critical to finding employment. There are also situations when how you ask for a job is very different. For instance, when you walk into a business out of the blue, the approach you take when asking for a job is very different than when you are at the end of an interview and you ask for the job. Below is a look at different situations and approaches one should consider when asking for a job. I have done this and been successful, but it's not for everybody and not everybody can pull it off. You need confidence and a compelling vision in many cases. Most of the time, the way to ask for a job when you walk into a place on a whim is to ask for an application. 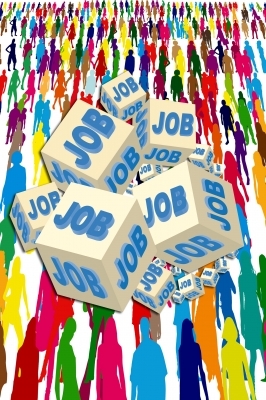 When you fill out an application, it is implicitly understood that you are asking for a job. However, in a competitive situation, sometimes it's important to stand out from the crowd and asking a few questions so that you can talk to somebody of influence in a business can be compelling. Let's say you walk into a "Best Buy" with the intention of applying for a sales position. Instead of simply asking for an application, you go to Customer Service and say: "If I were to apply for a sales position, who would do the hiring? Could I speak with that person?" If you're fortunate enough to speak with the person, you could say something like: "Hi, my name is Steve and I'm going to apply for your sales position. I know it might not be normal to do this, but I love electronics and I think I could make a difference here. I'm excited about any opportunity to work here and look forward to meeting you again." There are many versions of the above that could work well, but anything with personality that's a bit unique or well though out would probably work. You just want to make the exchange quick and not appear weird or needy. In my own experience, I walked into the office of a local newspaper, asked to speak to the Entertainment Editor, then told him I thought he needed a film critic and that I would be the ideal candidate for the job. I ended up working there for the next ten years. What's the most important part of asking for a job? Employers like people with ambition. An evaluation is always the opportunity to convey to your employer that you'd like to find more ways to contribute. 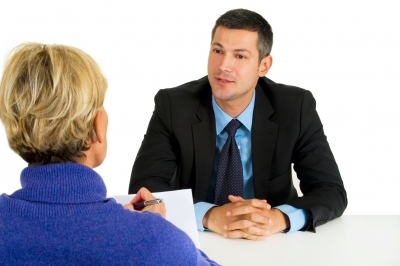 An evaluation is effectively an interview for your next position at the company. In my experience, there are two types of people in these situations, those that ask what more they can do for the company and those that ask what more the company is going to do for them. The former are always willing to put in more effort and to take on more responsibility. The latter are always asking for more money before they've actually done anything more. When they're offered more responsibility, they ask how much their raise is going to be. Not surprisingly, the former always get the promotions while the latter end up stuck. Sometime during your evaluation, say some version of the following: "What more can I do for the business? I'm interested in being the most valuable asset I can be and I feel like I have more to offer. I'm willing to do whatever it takes. I hope that if there are additional opportunities here, you'll consider me." There are lots of ways to say this and it's something employers love to hear. Although networking doesn't usually involve directly asking somebody for a job, it has the same effect. By making contacts and communicating with people in fields that you are qualified to work in and by developing those relationships, those contacts are more likely to think of you when considering filling a position they may have. If they are familiar with your experience and resume, then when you find yourself in a position to ask for a job from one of them, you've already done a ton of work. Through networking, a potential employer may already know so much about you that asking for a job just turns out to be a formality. Networking is a continuously active way to pursue your professional interests and keep yourself relevant. The opportunity to ask for a job at the end of a job interview is perhaps one of the most often missed opportunities for potential candidates. In fact, most interviewers are waiting for potential candidates to seize the opportunity to ask for the job. Now, this doesn't mean saying "Can I have the job?" It means demonstrating through words that you want the job in a fairly direct way. It could be anything from a confident statement of how one's qualifications perfectly match what a company may be looking for to a rah rah statement of enthusiasm. Frankly, I think the latter is often preferred, something along the lines of: "I'm very excited for the opportunities this position and this company offer. I believe I bring the right combination of skills and enthusiasm to this position and I hope that you offer me the position because I would very much like to work here. I love the environment and the people I've met seem fantastic." Another frequently missed opportunity. This is old school, but remarkably effective. Taking the time to perform this simple courtesy will win you major points with a potential employer. Effectively, you repeat whatever statement you made at the end of the interview about wanting to work for your potential employer. A thank you note indicates a level of professionalism that most employers will recognize and appreciate and it gives you one, final chance to make another good impression. Have you ever asked for a job and been hired? When you really, really, really don't want them to hire you, ask a few of these questions during your job interview. Hey, might as well go out with a bang. Thanks for your clear thinking. As a career counselor I know too many people who go through hoops to get an interview, then think that the employer is going to offer the job. Often, among a number of good candidates, the one who gets the job is the one who asks for it! Good points you make. It takes practice to have a good interview and you give good advice to job hunters who may need encouragement. These are excellent points. With more competition now than ever before, it's so important to stand out from the crowd. This is a great outline of ways to do that (in a GOOD way!) -- thanks for the hub!